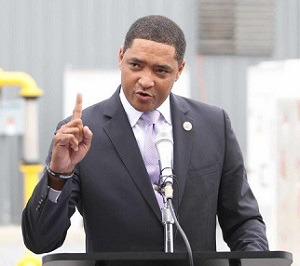 U.S. Rep Cedric Richmond, D-La. Does the NCAA’s emphasis on “amateurism” promote student-athletes’ best economic, mental, physical and educational well-being? Is the NCAA’s current operating model promoting economic and racial inequality in the United States of America? Does the NCAA apply similar penalties for similar infractions across all members, including incidents at Historically Black Colleges and Universities? Does the NCAA’s current operating model promote anticompetitive effects in the college athletics marketplace? Does the current length of scholarships for student-athletes maximize learning opportunities for student-athletes? Is the NCAA exercising monopolistic market power or creating a monopsony effect in the market for college football and basketball players? Does the NCAA offer sufficient opportunities for its student-athletes to support themselves economically outside of their role as student-athletes? Does the NCAA’s current distribution of revenue add value to the delivery of educational services for a high percentage of member institutions? Does the NCAA audit or monitor revenue distributions to member institutions to ensure that they are being utilized for their intended purposes? Do university athletic departments operate with sufficient oversight and accountability? Does the NCAA have a responsibility to its student-athletes after their time as an athlete concludes? How might changes to the NCAA’s operating model affect the ability of member institutions to finance NCAA sports programs that fail to generate sufficient revenue? “Now that you have crowned new national champions in college basketball, it is imperative that you and your members consider the talents and labors that made these occasions possible,” said Richmond in his letter to Emmert. Last week, the NCAA Board of Governors voted to accept the recommendations of a special panel that proposed drastic changes to college basketball. The decision came after the board met with the 11-member panel of the Commission on College Basketball and its leader, former U.S. Secretary of State Condoleezza Rice, who released a scathing report on the issues that plague the game.